WASHINGTON — Vandals toppled a Ten Commandments monument this past weekend that was erected on private property a block from the U.S. Supreme Court. The monument was installed in 2006 at the headquarters of Faith and Action, a ministry led by Rob Schenck, who serves as an evangelical minister and a member of the U.S. Senate Chaplain’s Pastoral Response Team. It was positioned so that the justices who sit on the nation’s highest court could view God’s law as they entered for work each day. However, according to reports, sometime between Friday and Saturday night, vandals pushed over the 850-pound granite monument and then bent the steel rod that secures the tablets to the base. A “for rent” sign was also found in the lawn near the toppled monument. He says that he plans to reinstall the monument and also purchase security cameras in order to capture any suspicious activity. Faith and Action had difficulty installing the tablets when they first purchased the display, as they were denied a permit by the city. After sitting dormant for five years, Schenck decided to erect the monument anyway, and while he was initially threatened with a fine for proceeding without a permit, he has not had any issues from the city or its residents–until now. “We thought the controversy surrounding it had long since subsided but apparently not,” he told the Huffington Post. Police have not yet identified any suspects in the incident, but did investigate the matter. Ten Commandments monuments have often been at the center of controversy in recent years. 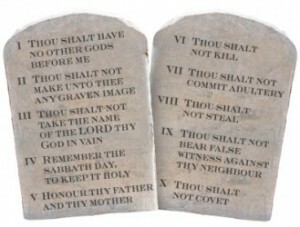 As previously reported, last May, a district judge in Virginia ordered that a public school reduce the Ten Commandments to six and remove the laws that mention God. “If indeed this issue is not about God, why wouldn’t it make sense for Giles County to say, ‘Let’s go back and just post the bottom six?’” Judge Michael Urbanksi asked. However, in a similar fight in Pennsylvania, where an atheist organization is seeking to have a Ten Commandments monument removed from the lawn of the Connnellsville Junior High School, a local pastor is fighting back by installing monuments all throughout the community. Marietta is also collecting petition signatures over the matter, and nearly 5,000 Ten Commandments yard signs have been sold to help pay for the monuments.